GTA Chinatown Wars official website launches with new trailer! Rockstar have launched the official Chinatown Wars website and with it released a new official trailer for the game, along with new screenshots, character bios and more. Also on the site is the first of series of feature clips, this one focussing on "Hotwiring, Carjacking & Peeling Out". Be sure to check that plus everything else at the official site. Rockstar Games have announced they'll be going on tour across the US hosting Chinatown Wars hands-on experiences at hundreds of GameStop stores. As well as playing the game you'll also get to take home some rare GTA swag! The tour will last for 6 weeks and take place across 52 US cities, using 3 special Rockstar vans. See the Chinatown Wars tour page for the full details and to see when R* will be at your local store. Still not sure whether you want to get it? If you missed our own hands-on last week, why don't you give that a read, might help sway your decision. Today I have uploaded a 100% checklist for The Lost and Damned. An HTML version is viewable on the website for those of you just wanting a quick look to see what you've got left to do, a printable .pdf is also available for those of you who want to print it out and tick off everything you've done so far. We believe the checklist is entirely accurate and will guarantee you 100% completion, additionally, there are no actions that can prevent you from getting 100 percent, even cheating won't mess up your stats. However, if you do think there are any mistakes anywhere, please point them out to us so we can fix them. Hope you find it useful! A commercial for the next hand-held GTA is now airing in the U.S. The Chinatown Wars commercial is a mix of artwork with some actual in-game footage, and highlights the protagonist�s view on what is �the key to building an empire.� The ad also takes note of GameStop�s pre-order deal, which lets you start the game with ,000 and allows you immediate access to Ammunition. Rockstar just emailed us to give us all a heads up about the final three days of Xbox 360's Grand Theft Auto IV: The Lost and Damned Xbox LIVE Week. Just wanted to give you a heads up to remind you that this weekend is the final three days of Xbox 360's Grand Theft Auto IV: The Lost and Damned Xbox LIVE Week. This weekend's events include the opportunity to play with some of the crew from Rockstar North tonight from 5-9 PM EST, and the chance to play with soundtrack artist and Beat 102.7 DJ Statik Selektah and guests on Sunday from 4-7 PM EST. I hope you are all enjoying the game so far and we look forward to seeing you online this weekend. Visit http://www.xbox.com/lostanddamnedliveweek/ for more details. Before all of our flights back from New York last Wednesday, we all had a few hours to kill. Because of this, Rockstar decided to allow us to come to their offices where they had a little treat in store for us all. As there were quite a few of us there, we went in two groups, the UK guys (me, Psy, Adam, Jevon) went first due to our earlier flights, while the Americans (illspirit, G-WizZ, Kodo, Zidane) went in after we'd finished. Not only were we going to be shown Chinatown Wars, we'd also have a hands-on with the game! The last part of my fansite event diary/preview thing is now online for all to read. If you didn't see last week when I posted about The Lost and Damned part of it then you may want to start from there, if you did then simply skip ahead to the final page to read my hands-on preview of Chinatown Wars. If what you've seen hasn't impressed you so far, then be sure to read this as it may just change your mind. Again, if you have any questions for me about the event or about what I saw of Chinatown Wars, then don't hesitate to ask in the comments, I'll do my best to answer any questions you have. Just a quick heads up to everyone to say that you should now be able to find The Lost and Damned in the Xbox 360 Marketplace. The download is 1600 MS Points and is actually a whopping 1.78GB, unlike some reviews told us. Find it in the new arrivals section of the game marketplace, or if it's not there just browse through All Games -> G -> GTA IV and find it there. Alternatively, the download queue link should be up on xbox.com fairly soon, clicking that will add it to your 360's download queue and automatically start downloading next time you turn it on. Rockstar have just sent the fansites an exclusive Lost and Damned screenshot of Johnny and the gang. Take a look in full by clicking on the thumbnail below, you may notice a familiar face in the background. The Lost and Damned reviews now online! TotalVideoGames have also confirmed the size of the download, which is a huge 994 MB, which is pretty close to our estimates of around 1GB. The download actually comes in at a whopping 1.78GB, so chances are you're going to have to wait a while until it finishes downloading. Additionally, Rockstar have updated the official GTA IV website with a special Weazel News report on biker gang violence in Liberty City. 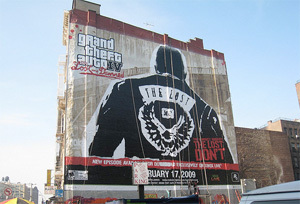 As you may know, earlier this week Rockstar Games flew myself and several other webmasters from the large GTA fansites out to New York City to preview The Lost and Damned. I've now written up my diary/preview of the event which you can read on The Lost and Damned fansite event page. The event was hosted by Rockstar Games and Microsoft, and the preview itself was from 2pm-6pm on the Tuesday. The rest of our time there has been detailed in my preview, with some photos I took alongside (unfortunately none from the event itself as no cameras were allowed). The other webmasters that attended were Psy from GTA4.tv, Adam, Jevon and illspirit from GTANet, G-WizZ from GTAWH.com, and finally, Zidane and Kodo from GTAGaming. I'd like to personally give a massive thanks to Rockstar for inviting us all out again to this event. I had a great time both playing the game, as well as meeting various Rockstars and the other webmasters again. P.S. If you have any questions about The Lost and Damned, or anything to do with the event itself, just ask them in the comments and I'll do my best to answer them for you. The Lost and Damned trailer 2 now live! In addition to the new trailer above, there's also pages detailing all the new weapons and vehicles. IGN have also published a multiplayer modes preview, which talks about all the new multiplayer modes they got to play. We've added 16 new multiplayer screenshots to our gallery too. Stay tuned to TGTAP over the next week because there's going to be a lot of GTA news being posted, and we and the other fansites will also be posting about our experiences at the recent fansite event for The Lost and Damned. We'll keep you updated. Several new clips, a few new bits of information, as well as a �snippet� of one of the new cut-scenes of Rockstar's The Lost and Damned can be found in the latest episode of GameTrailers TV. Some of the information and clips found in the video hold some great new insight to how the game will feel and how it may intersect with the previous story. � The game will start right away, thus you won't have to endure a long and slow introduction. You'll be thrown right into the action. � Handling of bikes has been improved to make riding easier - this is justified because Johnny is a more experienced rider, therefore he should find it harder to crash. � The manly sport of arm-wrestling has made it's way into the 'mini-game' category. � A couple of new weapons will be made available; a new shotgun and a new grenade launcher were mentioned. � There are many more points of interest, however you'll have more fun watching the video. Check it out. Just wanted to give you a heads-up and let you know that Grand Theft Auto IV: The Lost and Damned will be featured on a special episode of GameTrailers TV tommorrow night, hosted from our office in New York City. There will be tons of never-before-seen footage, including exclusive first glimpses of various cut scenes, gameplay and hints about what to expect from the storyline. GameTrailers TV airs Friday night at 10PM PST / 1 AM EST on Spike TV, and is also available online at GameTrailers.com and on Xbox LIVE, iTunes and Amazon Unbox. So make sure you're tuned in on either Spike TV or GameTrailers.com at the specified time, should be an interesting watch. Rockstar have announced that a new trailer for The Lost and Damned will be going live next week, so keep an eye out for that. 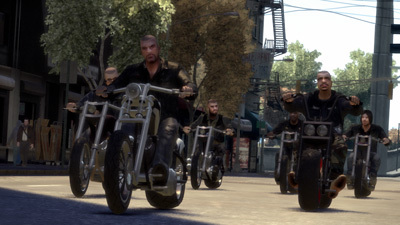 Rockstar also added a new screenshot on the Official GTA IV site entitled "Angels of Death", check that out below. Rockstar have given us the heads up to let you all know about an upcoming fansite event for The Lost and Damned. You may remember last April myself and some of the other fansite webmasters were invited to New York to experience GTA IV first hand. Well Rockstar have been kind enough to invite us all back again, so it looks like we'll be getting a similar experience this time round with The Lost and Damned. I will indeed be going, and I'll try and find out some info for you but you know what R* are like! Still, if you can think of any good questions for me to ask them about the DLC then go ahead and post a comment. I'll also hopefully get some better photos this time round and will share them all with you once I get back, along with a unique fan perspective/review of the game and experience as we did last time. P.S. If you didn't see it earlier, there's some awesome new hi res artwork for TLAD out. Also on the subject of artwork, Patrick Brown, whose name you may recognise for creating some amazing fan artwork for the GTA series has made yet another astounding piece. We've posted about him once or twice before, and felt this latest piece was definitely worth a mention. Check out his DeviantArt page for loads more.